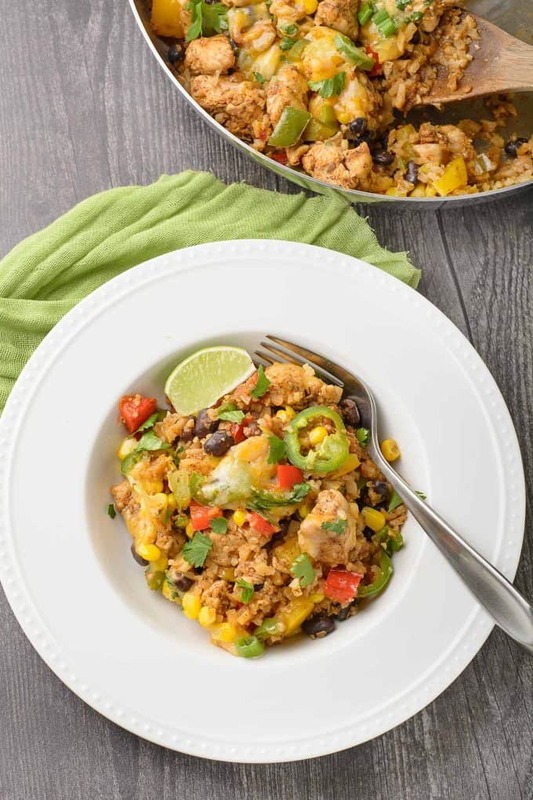 This satisfying, one-pan recipe for Chicken and Cauliflower Rice is easy to make and loaded with bold, Southwest-inspired flavors and ingredients. 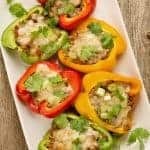 If you enjoy Southwest-style seasonings and ingredients like jalapeño peppers, scallions, fresh cilantro and lime, this recipe is sure to become a favorite. 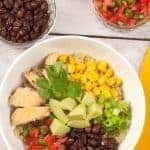 In addition to the riced cauliflower, other main ingredients include chicken tenderloins, sweet bell peppers, corn, black beans and shredded cheese. Preparation is easy and only takes about 45 minutes. The first step is to cut the chicken tenders into bite-sized pieces, toss them with some olive oil, chili powder and cumin and sauté until lightly browned. Next, the pan is deglazed with a little broth and the chicken is simmered for an extra minute or two and set aside. 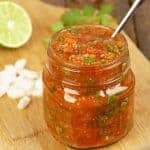 The richly flavored broth that’s left in the pan is used to cook the cauliflower, which is then spiced up with some salsa for added flavor and combined with the reserved chicken. 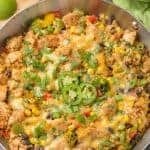 To keep cleanup to a minimum, the same pan is used to sauté the onion, garlic and bell peppers, then the corn, black beans and remaining ingredients are added along with the chicken and cauliflower. 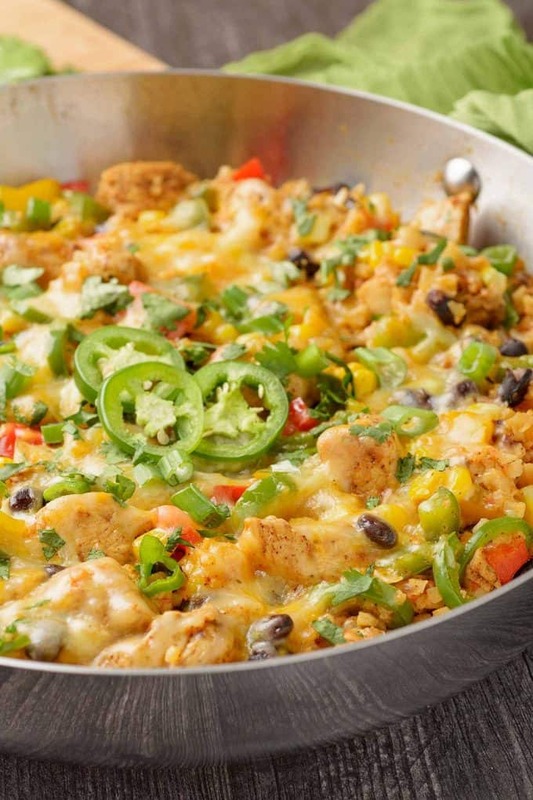 The finishing touch is to top the whole mix with shredded cheese, cover the pan and heat until the cheese has melted and everything is piping hot. 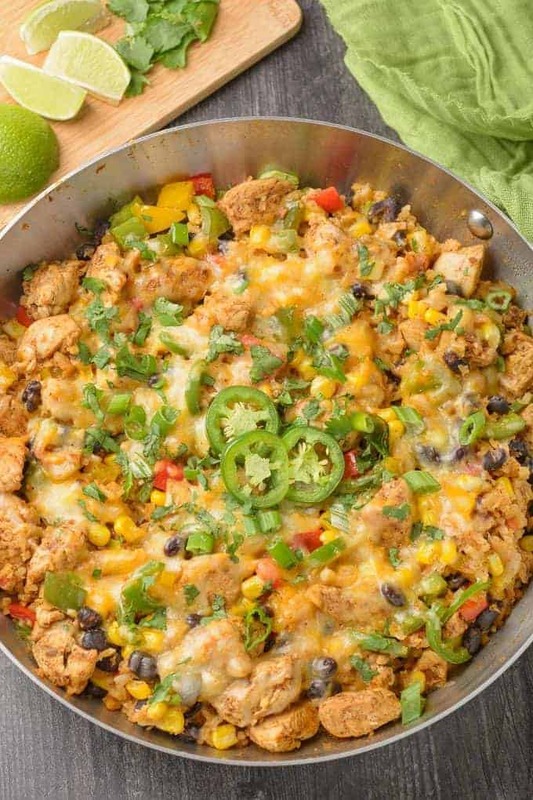 To serve, plate individual portions, add a lime wedge, a sprinkling of cilantro and enjoy! Riced cauliflower serves as a great substitute for regular rice in a wide variety of dishes, which is why we always keep a couple of bags of frozen on hand. 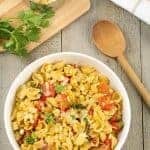 It’s become a go-to ingredient in our kitchen because it’s lower in calories and carbs than regular rice, faster-cooking and, depending on the dish, just as satisfying. As much as we like riced cauliflower for some recipes, we stick with regular rice for heavily sauced dishes like Louisiana Style Shrimp and Rice and Easy Chicken Curry.